I'm not fighting this cancer alone. even more badass than shouldering a huge f-ing gun, and also be a major style improvement." Joe's parents, Phil and Pam, have done so much for us from food preparation to helping interpret the bills coming in & talking to the insurance company, to watching Nia nearly daily. And my dad, George, has done the same: Helped out tremendously with Nia as well as gone to chemo with me. 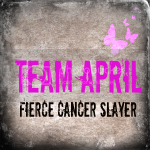 There are so many of you out there who are a part of Team April. I want to take a moment to thank you and tell you honestly, it make such a difference! Some of you have been bringing amazing, nutritious meals to my family; some of you have been taking Nia out for extraordinary play dates; some of you have sent me creative gifts to make getting through chemo easier; some of you have bought and knit hats for me; some of you have actually joined me for my chemo treatments; some of you are running in fund-raising marathons for women's cancers; some of you have paid into our grocery accounts; some of you are giving me alternative treatments (acupuncture, massage, vitamins); some of you are my colleagues and are helping releave my work burdens; some of you are supporting me through your support of my blog -- thank you all for your uplifting comments. Joe and I both get a lot of strength from them. If others of you are inspired to shave your heads, too, please send me your pictures! Let's build a Team April gallery of shiny, healthy heads! I [Heart] Team April! So much.